Wither you are a paraglider or hang glider pilot who is setting out for your first cross country flights. You want to know where the wind is blowing from, and at what strength during your local joy flights. You are getting into competition flying and will soon fly your first races. You are an experienced pilot who loves simplicity and still wants to know about airspaces in your vicinity. 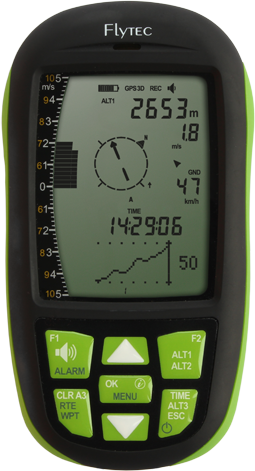 That makes you the pilot for whom we developed the vario “Element”. • More details under technical data. The Element keeps getting better. Over the next several months Flytec will continue developing the software and adding new features. Go to their website and give them feedback to help them include features that will help you develop your flying game.